Comes Individually Boxed with Printed Instructions. Great Gift Idea. Thai Sticky Rice (also known as "sweet rice" or "glutinous rice") is a tasty, sweet rice that does a great job of filling the stomach--but be careful not to eat too much... According to Thai tradition sticky rice can put you fast asleep if more than a couple handfuls are eaten. It is meant to be formed into small balls that you make with your fingers. Then dip it in spicy sauce and let it soak up like a sponge. In addition to sticky rice, you can also use the steamer to prepare fish/vegetables. 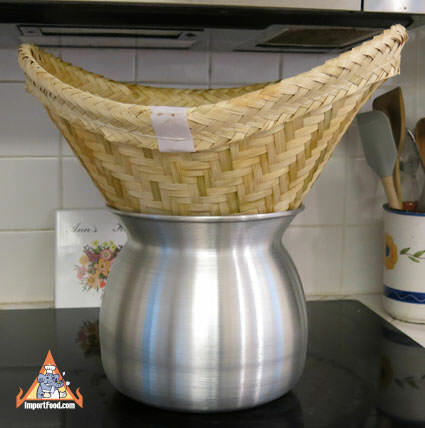 The sticky rice pot and cheesecloth can also be used to make fresh handmade rice noodles. We also offer Thai purple (black) sticky rice, and we have Thai jasmine rice. See below for our detailed Thai Sticky Rice Preparation Instructions, and Street Vendor Video: How to Prepare Sticky Rice. See our entire selection of Sticky Rice Cookware. Sticky rice is enjoyed throughout Thailand and Laos, and is gaining popularity as more people come to know it's unique delicous taste. A wonderful, delicious recipe that's easy to prepare. An authentic Thai snack that may seem like a trendy take on sticky rice but Khao Neeo Tod is found in the oldest Thai cookbook we own. It's been enjoyed for years in Thailand but we've never seen it served outside of Thailand.